Neil Gaiman recently made a fantastic speech about why we read and why we write. I love to see these kinds of articles from my favorite authors, because they all essentially boil down to the same message: we read because it helps us to understand the world we live in and to envision a better kind of world. We write because we want to share what we’ve learned and to help other people along their journeys just like all those other authors helped us. 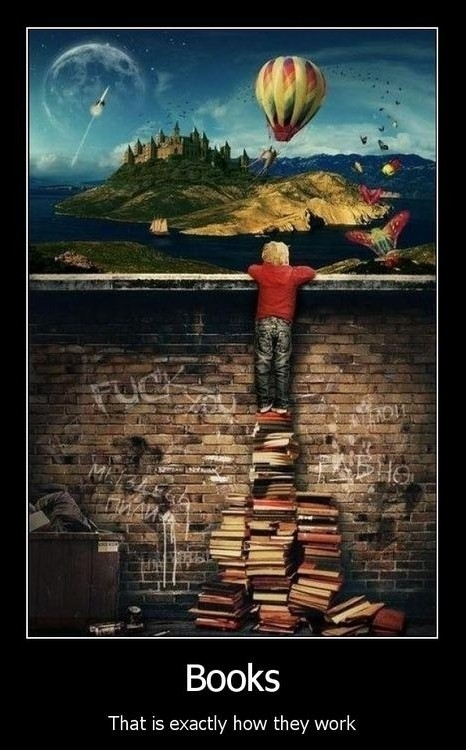 We read because it changes us for the better, and we write because we want to pay it forward. Here is an observation I have made about writers and other artists who have overcome personal hardships to become happy and successful: they want other people to be happy and successful too, but they understand that the path to happiness and success is an effortful and often grueling journey. They urge you to remember the lessons you have learned along the way, because to forget is to risk repeating your mistakes. They share the bits of wisdom that they have accumulated on their own journeys, because that’s what writers and artists do. Sharing what we’ve learned is a huge part of what drives us to create. One of the first things that happened when my marriage ended five years ago was that I found some new (to me) blogs and started following them closely. They were mostly written by people who were struggling through personal hardships of one kind or another and trying to make sense of their experience. Reading their words of humor and rage and sorrow and joy helped me tremendously on my own journey. They made me feel less alone and offered new insights into my own experiences. Those bloggers made a positive difference in my life. They were a big part of my healing process. Most of them I don’t follow much anymore, just because my life and theirs have all changed over the years and their experiences don’t speak to my particular issues anymore. But I’m grateful that they’ve taken the time to share their journeys, and I know that their words still help a lot of people every day. Most of the followers of my own blog are writers or artists of some kind, so I want to bring up something that for some reason is rarely addressed in “the value of self-expression through art and literature” essays. No matter how large or small your audience is, there are always people who want to silence you. If you’re a writer or an artist who works from personal experience, you know the people I’m talking about. When you write or paint or sing about a hardship that taught you something they get angry, not about your ordeal but at you for talking about it. They usually couch their censorship in dishonest phrases: “Just let it go,” “move on already,” “that was the past, forget about it already” and so on, as if sharing what you’ve learned — as if fulfilling one of the most basic functions of being an artist — somehow means that you’re stuck in the past and unable to move forward. But like I said, it’s dishonest, because that’s not really what they’re angry about. So this message is for everyone out there who creates art as a way to work through difficult experiences or to share what they’ve learned with others: don’t listen to the people who try to convince you that the “healthy” way to deal with your experience is to pretend it never happened. Their intent is the opposite of their words. They don’t want success stories or the sharing of lessons. Censorship breeds ignorance, and ignorance makes people gullible and easy to manipulate. There’s a reason why art and censorship are natural enemies. Somewhere out there is someone who needs to hear your story. Go tell it loud and clear.